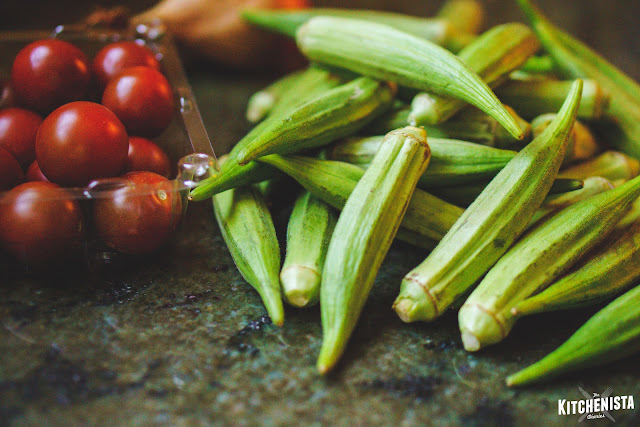 Okra has been a favorite vegetable of mine for quite some time now, going back to this okra and eggplant curry I blogged about in the early days of this site, and most recently in my smoked turkey gumbo. Vegetarian dishes often prioritize veggies like eggplants and mushrooms for their meaty qualities, but I think okra is equally valuable. It has a unique flavor and a crisp texture that stands up to the cooking process, whether it's pickled, fried, roasted or stewed. 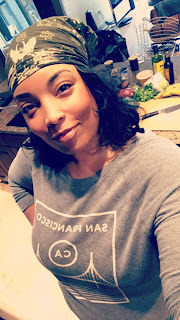 Okra has always been important to cooks in the diaspora and for that reason I wanted to highlight this versatile vegetable during Black History Month! 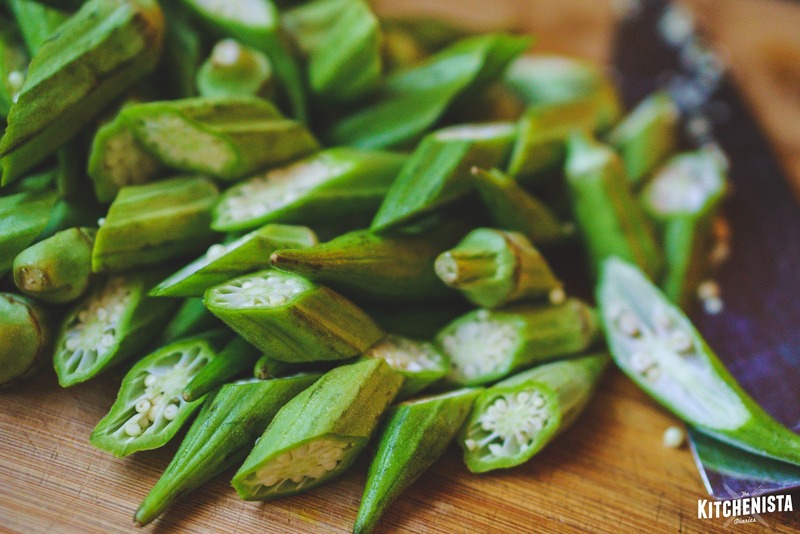 As culinary historian Michael Twitty notes, okra's roots can be traced back to Ethiopia and West Africa. Okra was brought to North America as a result of the trans-Atlantic slave trade and grown here by enslaved Africans. It was often boiled with tomatoes or cowpeas, served with rice, and incorporated into soups. 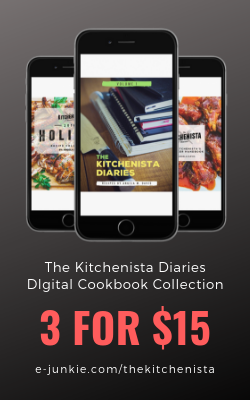 Those traditions hold true today in various reiterations familiar to southern cooks. For those who truly love okra, the "slime factor" is embraced head-on, even prized as a thickening agent for soups and stews. If that turns you off a bit, there are ways to cook okra to minimize its mucilaginous qualities. 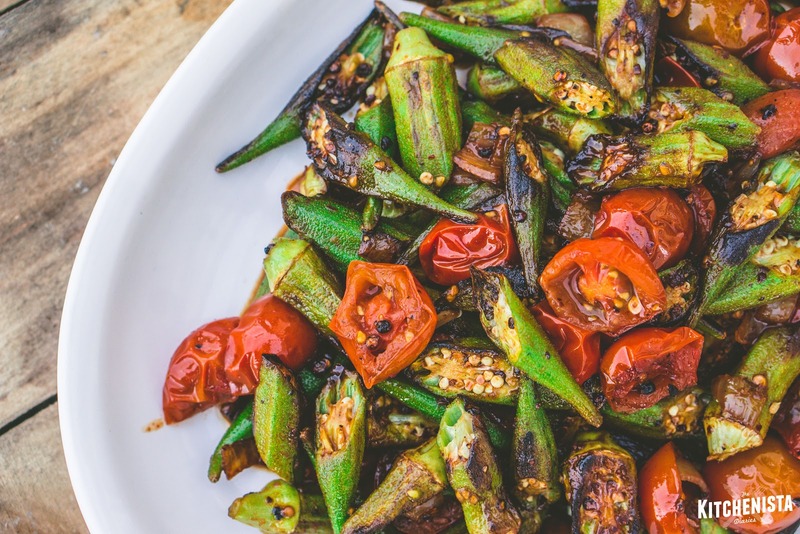 Roasting okra quickly at high temperatures in the oven does the trick, though for even better flavor I turn to stir-fried preparations. 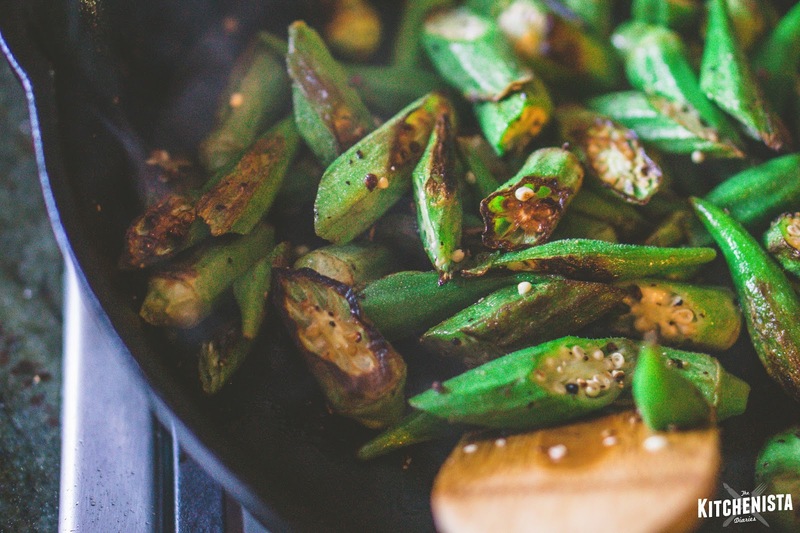 Pan frying okra in a well-seasoned cast iron skillet adds char and smokiness, so much so that you'll swear it's been grilled. 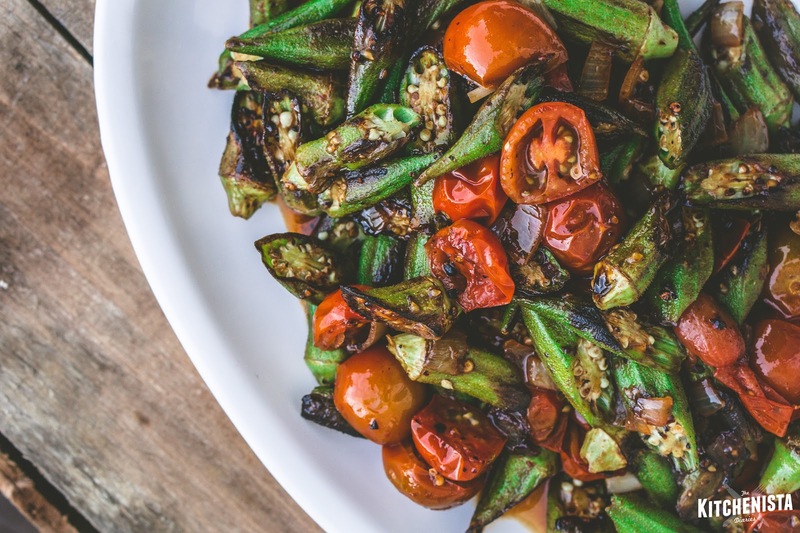 The inspiration behind this dish was pretty simple - okra and tomatoes are a classic pairing - but instead of a slow-simmered stewed preparation, I wanted something quick and fresh. (I'm also trying to get back to a healthier diet, so I resisted the temptation of adding shrimp and piling this over a bowl of grits. Mmm.) Besides the cast iron skillet, the keys to this recipe are using fresh okra and a high smoke point cooking fat. While frozen okra works fine in stewed preparations, it won't yield the same results here. Okra's season is in the summer, but once in a blue moon I come across fresh okra in the dead of winter that looks and smells good enough to make do! 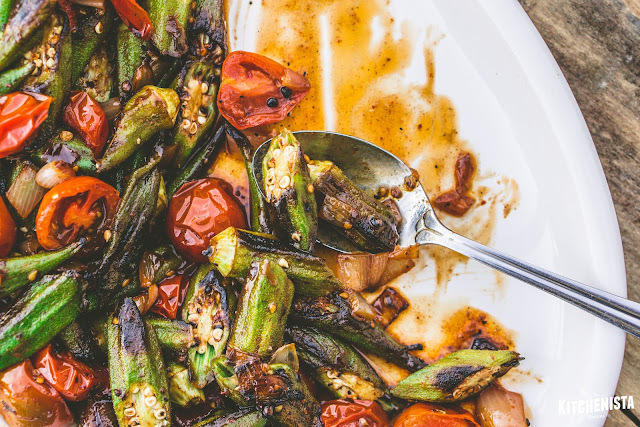 That said, nothing compares to the flavor of fresh picked okra when in season, so I'm definitely looking forward to revisiting this recipe in the warm summer months, when tomatoes are also at their best. In the meantime, it was a fun break from the monotony of winter greens, and I was excited to finally share something new for all of my patient vegetarian and vegan readers! 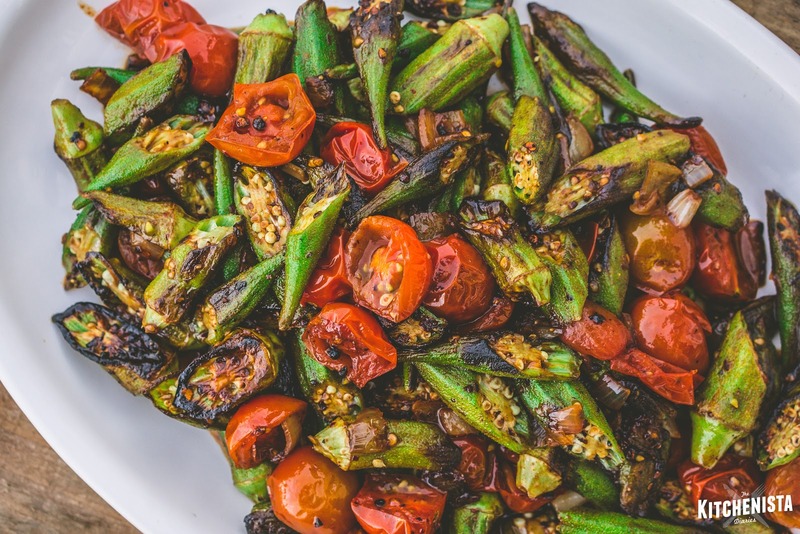 Notes: Because the okra needs to be cooked at extremely high temperatures to develop a proper char, you'll need to use a cooking fat that won't burn. If you're keeping things vegan, refined coconut oil is a great choice and will add a nice flavor. Otherwise, I highly suggest giving healthy fats like duck fat or ghee a try. 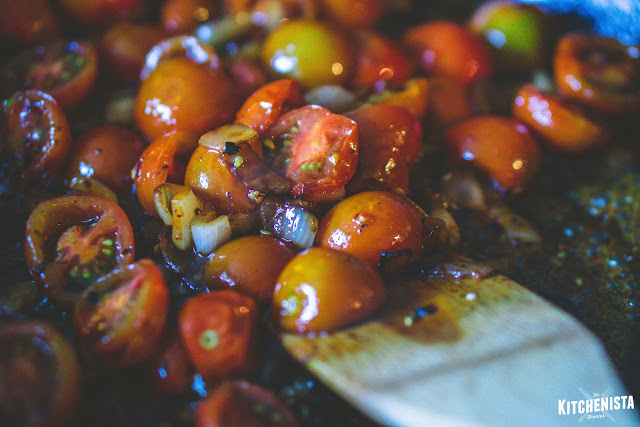 You could substitute a neutral cooking oil like grape seed oil, but you may want to stir in a pat of butter or drizzle some extra virgin olive oil at the end to make up for the lack in flavor. A hot skillet is essential, so before you begin get it preheated over medium high to high heat. You'll want the skillet to be just shy of setting off your smoke alarms, so adjust your burner's temperature based on your equipment. Meanwhile, give your okra a quick rinse, shake it dry, and slice on a bias. 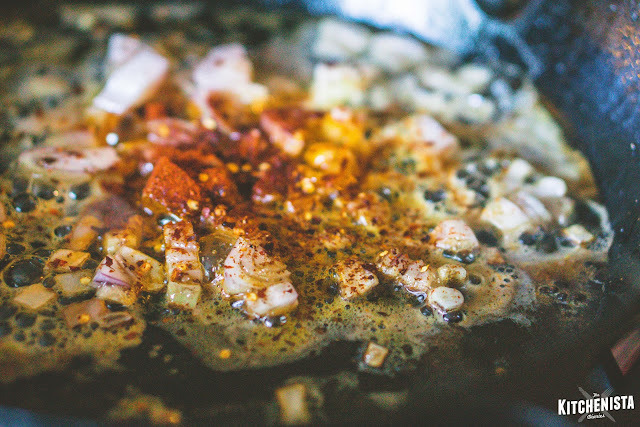 Add your choice of cooking fat to the skillet, enough to coat the bottom of the pan generously. Hopefully you've read my note above and selected duck fat. Duck fat is always the answer. Add okra to the skillet, carefully, because it will splatter some. Work in batches if your okra won't comfortably fit in one layer in the pan, otherwise too much of it will steam before it chars. This is the most important part. Once you've got the okra in, just leave it alone. Don't stir it, don't season it yet. Just let it make contact with the skillet for a minute or two and sear. Go ahead and dice that shallot and slice your tomatoes in half while you wait. Transfer the cooked okra to a plate and set aside. Turn the heat down to medium low. 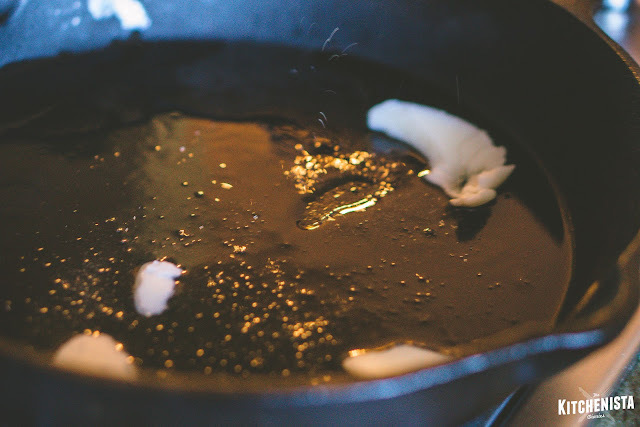 If necessary, add more cooking fat to the skillet. Add the diced shallots, paprika, and red pepper flakes. Season with salt and pepper, then saute until the shallots soften, about a minute. Stir in the halved cherry tomatoes. Any variety will do but heirloom tomatoes would be a nice treat. I picked up a pint of "Cabernet Tomatoes" which are super sweet and a beautiful dark red hue. Season the tomatoes with a pinch of salt and cracked pepper. 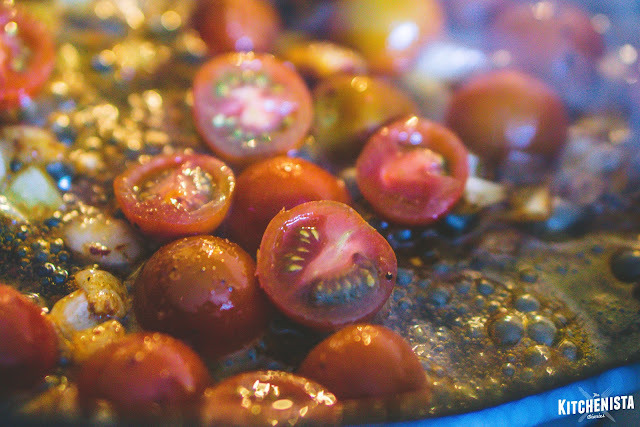 Let the tomatoes cook for a couple minutes, until they blister and start to release their juices but before they lose all their shape. Sprinkle the tomatoes with a squeeze of fresh lemon juice, or small splash of vinegar, which will add more acidity to brighten the dish. If desired, drizzle in a little bit of honey. 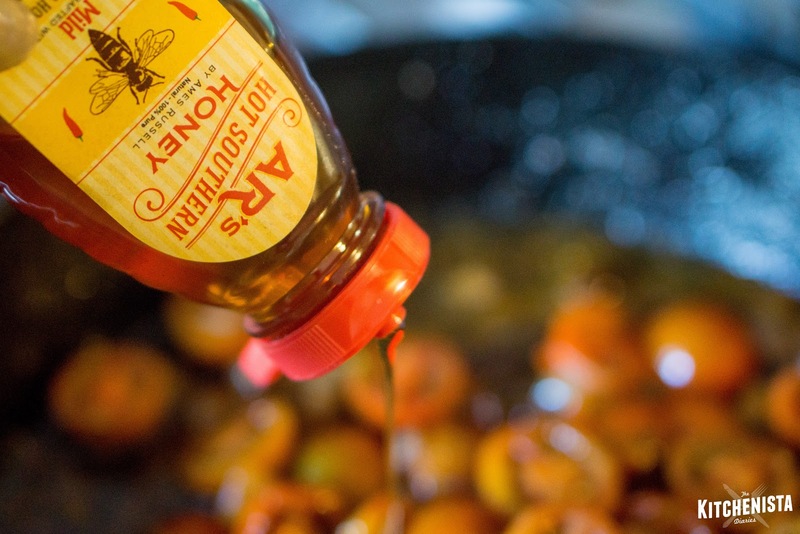 I used a spicy honey that I picked up at a food festival recently. The sweetness isn't mandatory and you're not adding more than a teaspoon, but it is a nice way to balance the (good) bitterness of the charred okra. For vegans, maple syrup will do the trick as well. 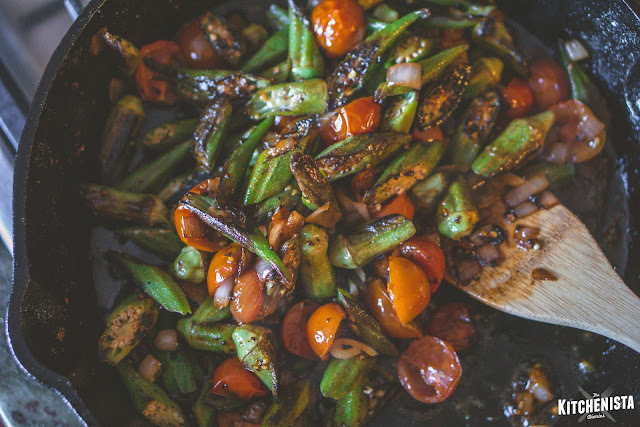 Finally, return the okra back into the skillet and toss to coat with those saucy tomatoes. After a final check for salt, you're good to go! 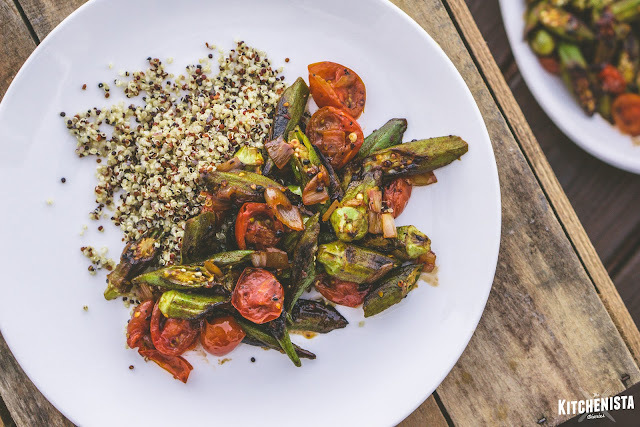 The charred okra and tomatoes would be awesome over rice or stone ground grits, but for a healthier grain option I went with quinoa and it still hit the spot. I admittedly ate half of this standing right over the skillet so I can promise you it's good all by itself too!